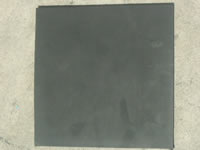 Product categories of Rubber Microwave Absorb Material, we are specialized manufacturers from China, Rubber Microwave Absorb Material, Rubber Sheet Absorber suppliers/factory, wholesale high-quality products of Magnet Loaded Rubber Sheet R & D and manufacturing, we have the perfect after-sales service and technical support. Look forward to your cooperation! 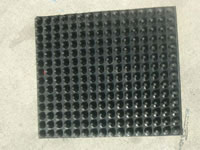 JRAT Rubber Sheet Absorber: is a series of absorber made of rubber filled with magnetic material. It is resonant absorber from its absorbing principle. Flexible and thin thickness, JRAT can achieve an optimal absorbance in a narrow band. However the band is still broader than those non-magnetic materials. The reflectivity at normal incidence could be up to -17 ~ -25 dB at resonant frequency. And the relative frequency width is 24% and 35% separately for the reflectivity of -13dB and -10dB. Little change is caused by the 30 degrees incidence and -15dB for 45 degrees. As for 60 degrees, the vertical polarization is about -7dB and the horizontal polarization is about -13dB. RAT is in gray color and has good strength and aging-proof capability. It can work -50~+ 100℃ . Another heat-resistant model, silicon rubber is available that can work in -50~+ 180℃ . RAT must be applied closely to the metal base. JRA Rubber Conical Absorber : is a kind of broadband absorber for millimeter wave . The reflectivity at normal incidence is -17dB and -25dB separately for the material thickness in wavelength of 0.35 and 1. For 60 Celsius off normal incidence, the reflectivity downgrades to -10~-17dB. Black, very good strength, excellent environment resistance and durability, RA can work outside in wretched environments with moisture and salty fog. RA is flexible can be curved when applied. Its power handling capability is 0.3w/cm 2 and can be operational at -50 ~ + 100 ℃ . RA is mainly used around radar and antenna, to isolate the remit and receive antenna, to cover the ship mast, to build small anechoic box and to cover those reflective components in testing fields, so as to eliminate interference and unnecessary reflection.